Clearly, "missle" missing the letter (i)...was a prediction by Q that ATS would move to (i)talics. Anyone ever witnessed anything like this on other threads? Is this something a mod or staff could have a look at? I mean, wouldn't there be some log about this somewhere? Could it be a glitch on ATS, or actually been done from 'outside'? My understanding of American politics is very limited, and with all the names and connections of people mentioned in this thread it's almost impossible to fully understand the bigger picture. Personally I feel that this whole thing has way deeper implications and I'm just trying to digest it all, mouth agog. 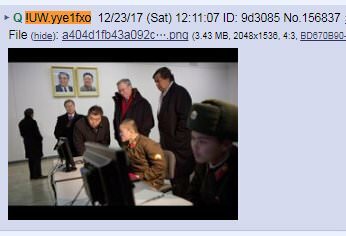 Q posted google Schmidt? in NK? I've seen it happen once or twice. "New kinds of proxy and firewall technologies might be able to break that, but it's not true today," Schmidt says. At this remark, Levie pretended to get excited, asking if there was an opportunity for cloud storage service Box in North Korea. "It's highly illegal to sell to North Korea...Aaron," Schmidt replied. Q wants us all to know we're being heard. MERRY CHRISTMAS, Q! ...and GOD Bless Us, EVERYONE! This is because part of the Q post contained bbcode for italics. [I] - this was done with braces but shows as brackets, if I had done brackets everything following would have been italicized.